Many hearing-impaired individuals have the ability to hear again with the help of a hearing aid but continue to live with their hearing impairment because they lack the financial resources to obtain a hearing device which can cost thousands of dollars. The ability to hear again is especially meaningful to Holocaust survivors whose senior years can be very difficult due to traumatic memories. “Being able to communicate with children, grandchildren, friends and even their physicians makes life less lonely and isolated and allows these folks to fully engage in the present,” says Gilda Katz, JFSA’s Holocaust Survivor Support program coordinator. On January 25th, 35 survivors were fitted with their custom hearing aids. 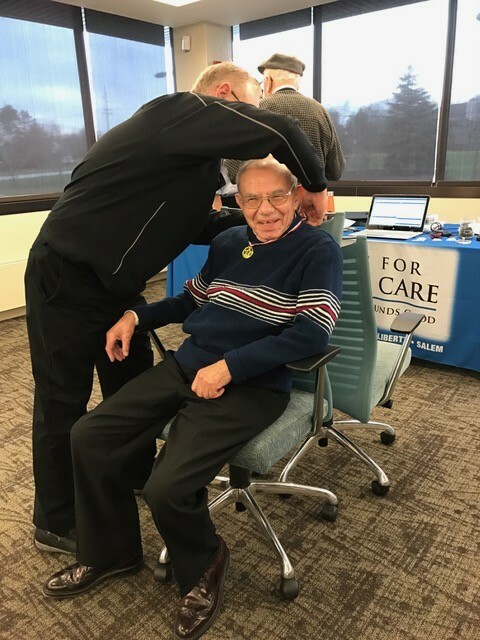 Since last November, the Hearing Missions Foundation, a non-profit affiliate of Centers for Hearing Care, and JFSA Cleveland worked together to bring free hearing aids to 35 local area Holocaust survivors. Survivors received audiological testing, their own custom-made and fitted hearing aids, a limited supply of batteries, and education and instruction on proper operation and care of their new hearing devices. “It’s not enough for patients to simply receive new hearing aids. Each recipient must know how to use and care for their devices,” explains Dr. Sheryl Figliano, Doctor of Audiology, at the Centers for Hearing Care and co-founder of the Hearing Missions Foundation. Survivors also received additional check-ups with the professional staff at the Centers for Hearing Care to make adjustments if needed. The survivors’ responses to hearing again was very moving. Big smiles lit up their faces once they realized how much better their hearing improved with the hearing aid.